This is no ordinary Karaoke Comp. It's a battle. If you don't like losing, don't enter. Prize money Set however, weekly raffles will be done to boost prize pot as well so these prizes are minimum pay outs could be more. 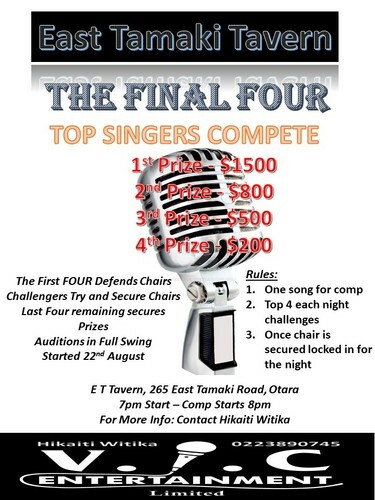 I regard these four amongst the best Karaoke Singers in Auckland all bar one has won numerous Competitions and Teejay is the Golden Voice 2018 Winner. Comp will only be 2 hours maximum so will start on time at 8pm on the 10th October. You Prepare two songs. 10 to 15 only entrances per night. Sing one song. Judges will choose the top 4 each night. Then the judges choose those names out of a Hat whoever's name is called first has first choice of which chair to challenge for. once challenge has been completed that chair is locked in for the night and comes back to defend the next week. Any way any questions feel free to ask. Ka Kite.